Peggy moved to Iowa and began her work at UUS in 2016 as the congregation was building its new green building. 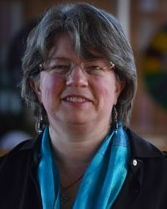 In her role as Director of Congregational Life, she oversees programs and classes for visitors and new members, works with Membership Associates to support member engagement, supports the work of the Publicity Team, leads the UU Wellspring program, helps engage members in programs of the larger UU movement, does strategic planning for new programs and community engagement, and fills in other ways as needed in the life of the congregation. Peggy served as minister of several United Methodist Churches in Michigan, taught classes and led retreats on connecting with nature through our senses, worked as Acting Assistant Minister at the First UU Congregation in Ann Arbor, Michigan, and has been both on staff and President of the Board of Michigan Interfaith Power and Light–helping religious congregations address climate change and save energy. She has also taught violin, done fundraising, and recorded a CD of original songs. Peggy grew up in the Chicago area, and went to University of Michigan where she earned a degree in Social Change. She lives in Coralville with her partner, Sarah Ross, and their three cats: Butter, Confetti, and Dulci. Peggy enjoys Scottish fiddling and dancing, reading, cooking, and sewing. She also enjoys visiting her two sons and a daughter-in-law, who live in Michigan and New York.